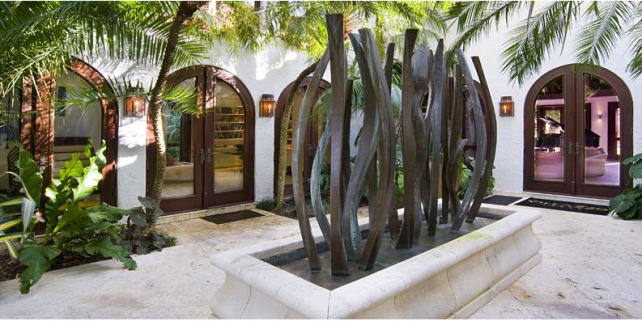 This incredibly private villa features a captivating garden; pool with waterfall and Jacuzzi; and patio, lined with picturesque palms and looking out onto an incredible view of the Miami skyline, while an inner courtyard, cobblestone terraces, and barbecue offer plenty of outdoor living and dining opportunities. The interior of Villa Amora is a true sight to behold. Invigorating architecture, decor, and art make every sprawling room a symphony of beauty, comfort, and luxury. The villa features a great room with vaulted ceiling, fully equipped gym, office, den, bar, gourmet kitchen, home theatre, and games room. The master bedroom features a roomy walk-in closet and master bathroom both fit for a king and queen, while all of the accompanying bedrooms offer stunning views and en-suite, spa-inspired bathrooms.